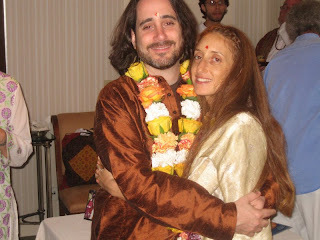 Well, all I can say is WOW about our wedding ceremony with AMMA. I honestly went with no expectations, just the intention to fortify and affirm the LOVE that Mira and I share. The marriage took place at 7:30 am on Monday, July 14th. It came after Amma's Devi Bhava program which goes all night beginning at around 6 pm. In those hours Amma hugs many thousands. As the room is filled with so much Love, many are meditating, chanting is going on and the vibration is one one of spiritual purity and deeply harmonious energies. Just lovely. There were many people in attendance and most special for Mira and I was that both our families were there as well as many of our beloved friends from Philadelphia and other parts of the country. The energy started picking up for us when we were invited to sing Kirtan for Amma during darshan. We were blessed to have some of our very favorite musicians present, Rama Bala, Philippo Franchini, Sam Rossitto and our great community of chanters. We began at 3:30 am and played for about 45 minutes and wow felt like the roof came off - so high. We included Mata Bhavani, Rama Bolo and the Hanuman Chalisa!! Then at about 6 am or so, we all began to dance to the chanting as we came closer to our special moments. As a result, and spontaneously, a circle of beloveds evolved around Mira and I while the two of us organically ended up in the middle. What extreme bliss this was. As Mira and I, in embrace, slowly turned to see each person in this circle, the love we received just flooded our hearts. I can simply say it was exalted to be surrounded by these special, beautiful beings sending us so much Love. I will never forget this moment - it was pure magic - nothing forced - just a spontaneous manifestation of the sweetest - the highest Love. This moment alone could last a life time of blessings for our union. As Amma finished her darshans, our time had come! Mira and walked up to the stage surrounded by our family and friends and sat in front of Amma. From then on was sheer bliss. Just Amma, Mira and I. Even though we could so deeply feel the Love around us, it was as if time stood still and it was just the three of us and a universe of infinity. It was time for our Love to be sanctified by the Divine Mother. Mira had made three beautiful flower garlands. We placed the first one on Amma, then Mira placed one on me and I on her. We then took sacred sandalwood and kumkum paste from Amma's finger and placed it on each others foreheads followed by waving the aarti lamp to each other with a bow, exchanging rings (which Amma kissed) and fed each other a hershey's kiss given to us from Amma. Then was darshan. Together we fell into Amma's arms and as our beloveds cheered - Amma, Mira and I giggled the laughter of eternal joy; as if the Gods were smiling, dancing and singing. This joy marked a profound acknowledgement; as if something that was meant to be had become ripe and was happening as planned. So simple, so sweet and with so much grace. What else could we do but bathe in the splendor of this exquisite perfection - so full of knowing and delight. Last, we walked around Amma three times and off we went filled tears of joy and vastness of heart. We had risen in Love!! At our recent Kripalu retreat our theme was Enlightenment. This term, enlightenment, is very interesting to me because it means many different things to many different people. In the Bhakti tradition, enlightenment is less about transcendence and more about deepening one's devotion to the beloved. In other words, to see the ONE in all. So to me, it's less about the dissolution of life to find some higher plane of existence. Rather, it is a celebration of life as it is. For, the world as it is, gives me an opportunity to Love others and to serve others. I can deepen my faith by trusting that each moment is perfect as it is and at the same time I can stay open to growth and make efforts to relieve the suffering of others. So, enlightenment, to me is a dynamic process. It is not a leaving behing but a deepening and an opening to Grace. It is not a goal, or even a desire to merge; but rather a moment to moment choice to appreciate the richness that the opportunities of life present and to respond to them with gratitude and conviction! 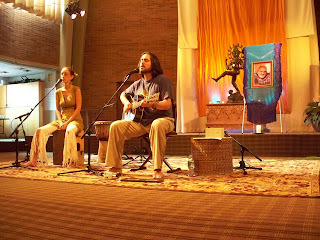 This photo is of Mira and I playing at the beautiful Kripalu "Main Hall". An amazing new Kirtan Book has just been released! It is entitled,The Yoga of Kirtan: Conversations on the Sacred Art of Chanting written by Steven Rosen - www.yogaofkirtan.com. 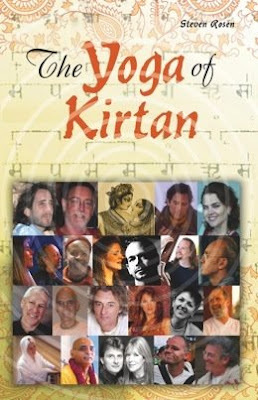 This book offers fantastic historic and modern day information about kirtan. There are full length interviews with myself and 20 other contemporary kirtan artists and a 70 minute music CD is also included with wonderful kirtan samples (including my Sita Ram from the Lotus Feet CD).